San Antonio Missions third baseman Jedd Gyorko will be the first to say that hitting in the Texas League is tougher than in the California League. So it's a testament to Gyorko's early productivity that, despite a cooling off just a bit, he still leads all the Minors in hits following a mid-season promotion. 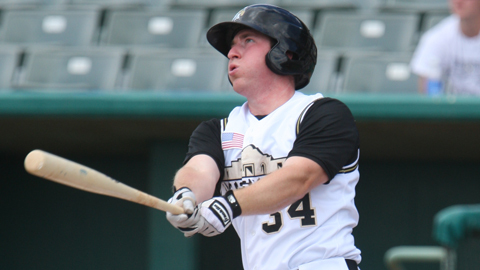 In 126 games between San Antonio and Lake Elsinore, Gyorko is batting .329 for the season with 169 hits, one better than Jacksonville's Vincent Catricala in the Double-A Southern League. "I have a pretty good formula, things I do before the game each and every day," said Gyorko, a one-time shortstop at West Virginia. "A pretty good routine I like to go through to try to get myself mentally and physically prepared each and every day to hopefully go out there and get a couple hits." He's still feeling his way through the Texas League, hitting .254 in 44 games, but thanks to a couple modest streaks, Gyorko is still the overall hits leader -- for one more day at least. "I don't think about it too much," Gyorko said. "It's hard enough to try to hit these pitchers down here in Double-A. So I'm worried about what they're trying to do and not worrying about anything outside my control." The past decade saw Texas League launching pads like the Dudley Dome in El Paso and Ray Winder Field in Little Rock fade into history. Hammons Field in Springfield is a favorite hitter's destination, but most of the other parks play fair or provide roomy comfort for pitchers, like Dickey-Stephens Park in North Little Rock or Wolff Municipal Stadium in San Antonio. "It's definitely more of a pitcher-dominant league," Gyorko said. "Some of the parks, the wind seems to blow in a lot more, definitely a lot more than it does in the Cal League. It's all about getting back to that base approach and trying to hit the ball square." The Padres drafted Gyorko in the second round last year, 59th overall. Admittedly, West Virginia isn't as storied as some college baseball programs, but Gyorko helped his Draft status by swinging wood bats in the Cape Cod League as a member of the Brewster Whitecaps. "That was really beneficial for me," Gyorko said. "It's good for those players to get out and be seen who are from some of the smaller schools you wouldn't hear of." Gyorko's summer work paid off with his selection and $614,700 signing bonus. He lit up the short-season Northwest League, batting .330 with 35 hits in 26 games for Eugene. He left the league as one of its top prospects and finished the year with Fort Wayne in the Class A Midwest League, where he batted .284 with 46 hits in 42 games. One preseason analysis predicted Gyorko would have a chance to "conquer" the California League with Lake Elsinore this year. He left the league intact, but he also left his mark. Gyorko had 39 multi-hit games with the Storm, seven during a 10-game streak in which he raised his average to .410 by April 22. Gyorko had a 17-game hit streak from May 3-20 and hit safely in 11 games from June 6-17, a streak that included a 5-for-6 outing at Lancaster and a 4-for-6 performance at High Desert. At playoff-bound San Antonio, Gyorko has posted a pair of six-game hitting streaks, but many of those games have been the one-hit variety. "I think the game gets faster and more consistent each level you go up, and that's mostly what I'm seeing right now," Gyorko said. "Pitchers know how to really control both sides of the plate and throw three or four pitches for strikes." Trout upstream: The Los Angeles Angels have recalled Arkansas center fielder Mike Trout for the second time this season, and don't think he won't be missed. Trout is hitting .326 with 11 home runs and 38 RBIs with Arkansas, and during his most recent 16-game stint, he hit .333 with 11 RBIs. Arkansas was 7-16 during Trout's first call-up to the Angels and went 10-6 during his return. Ross deals: Frisco's Robbie Ross notched his first Double-A victory Sunday in his best start of the year, yielding a run on three hits over seven innings as the RoughRiders topped the Tulsa Drillers, 6-2. Todd Traub is a contributor to MLB.com. This story was not subject to the approval of the National Association of Professional Baseball Leagues or its clubs.